The FS90R is a special servo made for continuous rotation. It can make full revolutions forward or backward, which makes it great for projects such as driving wheels on a small robot. 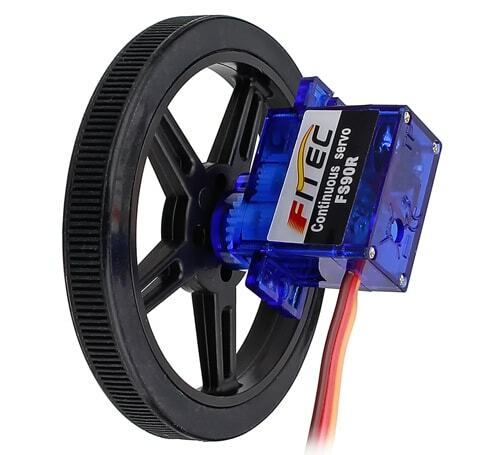 We also sell the 60mm wheels with tires made specifically for this servo. With traditional servos you can control which position (angle of revolution) the servo's arm moves to. With the same control signals used to control traditional servos you can control the FS90R servo's shaft to be stationary or rotating either clockwise (CW) or counterclockwise (CCW) and the speed of rotation. The signal you would use to tell a traditional servo to go to its middle position, 1.5ms pulse signal (position "90" when used with the Arduino Servo library), will cause the FS90R to stop, a 2ms pulse signal (position "180") will cause the FS90R to rotate full speed counterclockwise, and a 1ms pulse signal (position "0") will cause the FS90R to rotate clockwise at full speed. The FS90R servo includes an adjustment potentiometer to calibrate the middle-point (stopped) setting. Calibrate this setting by sending a 1.5ms (1500µs) pulse signal (position "90" when used with the Arduino Servo library), then slowly turn the middle-point adjustment potentiometer until the servo stops rotating. 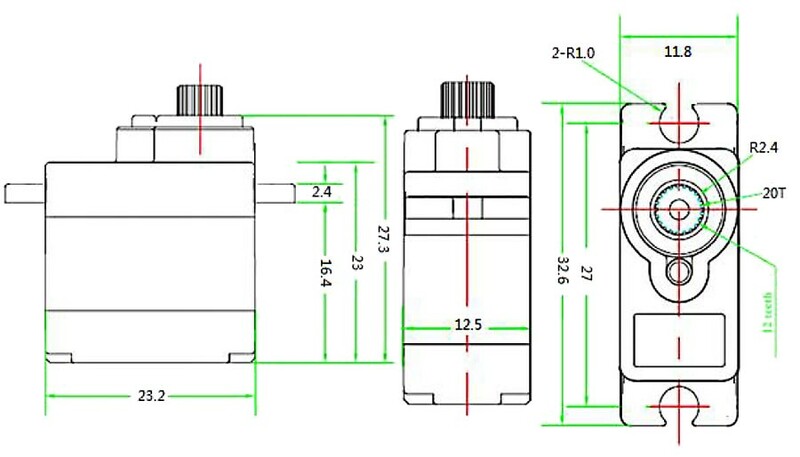 Access the middle-point adjustment potentiometer by inserting a small screwdriver into the hole in the bottom of the servo, see diagram below. The servo's cable has a standard JR-style connector on the end. I need a reversible DC motor that is geared down to provide significant torque. I could buy a DC motor, H-bridge driver and gearbox. Better yet, I use this little gem and control it via Arduino like any other servo. A couple lines of code set the speed and direction. Addicore price is as good as any I could find on the web and delivery is fast.